New Winter 2018: Send off the snowbirds on your list with a personalized camping ornament that looks great displayed anywhere. The RV camper personalized ornament is a delightful idea for any family or couple that enjoys hitting the road together to pursue fun, adventure or warmer weather! 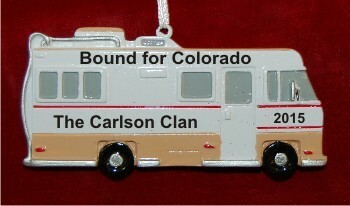 The RV camper on the road again ornament personalized from Russell Rhodes features the details you supply. They are painted on by hand in a font more stylish than shown to create personalized travel ornaments that are one of a kind. With a display cord in place and arriving in our exclusive velvet gift pouch, the motorhome personalized Christmas ornament will surely please.